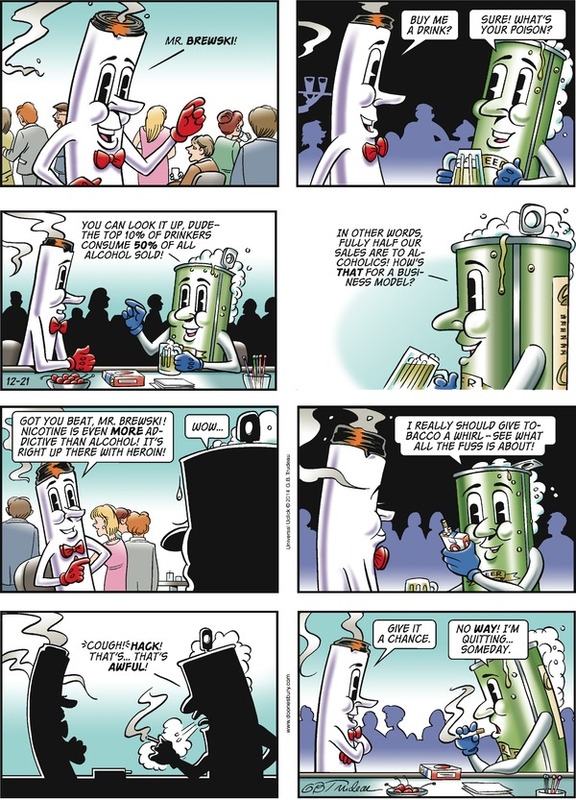 In case any of you missed it and as a year-end treat, please find below the December 21st, 2014, Sunday Doonesbury cartoon from the St. Louis Post-Dispatch, featuring Mr. Butts and his buddy, Mr. Brewski. Who can addict and kill more people? It’s no contest! Happy New Years, Martin! 🙂 Cute cartoon, but it reminds me of something I started to write about last week. I believe the roughly agreed upon figure for smokers vs. long-term ex-smokers out there is about 50-50, would you agree? mogasp comment: Happy New Year to you too, Michael. I’ve already spent longer on this than I wished to, so I’ll have to pass on a considered response. All I can say is that Gary Trudeau usually seems to have done his homework when it comes to his strips on this subject.